Planning pays off in most endeavors, and planning can pay off very well with respect to taxes -- or more accurately, failure to plan can cost you a lot of money. How, you ask? Consider these eight examples of planning failures that can lead to unpleasant tax surprises. 1. 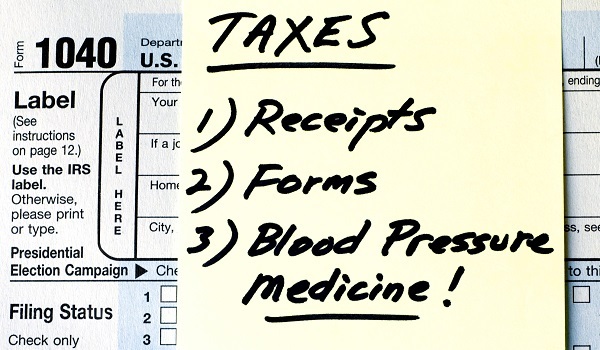 Poor Organization - Do you organize your necessary tax documents throughout the year so you can easily find them at tax time? Do you just leave them in a big stack until April 14th? Do you not even bother to put them in a stack? Without necessary tax documents or receipts to back up your itemized deductions, you run the risk of being unable to claim valuable deductions or even incurring penalties for failing to file on time. 2. Procrastination - It is human nature to put off unpleasant tasks like doing your taxes. Unfortunately, the longer you wait to get started, the more likely you are to make mistakes on your return or have trouble finding necessary information (see Poor Organization). 3. Failure to Adjust Withholding - Be sure to adjust your withholding to account for life changes like marriage, birth of a child, job changes, or raises (remember those?). Failure to adapt may result in the wrong amount of tax being withheld, potentially resulting in a large tax bill and/or underpayment penalties. Over-withholding is not good either, because you are just allowing the government to make interest on your money instead of claiming it for yourself. 4. Not Claiming Deductions or Credits - Do not just assume that you are not eligible for a particular deduction or tax credit, or that you do not have enough tax deductions to itemize. Look over your potential tax deductions at the beginning of the year so you can keep all the necessary receipts and paperwork to make your claims. 5. Failing to Report Health Care Subsidy Adjustments - If you received subsidies to help you pay for health insurance purchased on the federal exchange, remember that your subsidy is an estimate based on your information at the beginning of the year (projected income, family size, etc.). Should something change during the year to alter your estimated income or your qualification standing, you must notify the health exchange as soon as possible so that they can make the necessary adjustments. Otherwise, you could be stuck with an extra tax burden at the end of the year. 6. Failing to Track Carryover Items - Some tax benefits carry over into the next year if you cannot claim the entire credit this year. Examples include capital losses beyond the deduction limit of $3,000 and excess charitable contributions. However, you won't claim them if you forget about them, or have not tracked the carryover amount correctly. 7. Missing Quarterly Tax Payments - Independent contractors must pay their taxes quarterly once they achieve sufficient revenue. Making those payments late, or forgetting to make them at all, will cause you to incur penalties. 8. Vetting Preparers - It may be tempting to have your taxes done by those who promise you the largest refund, but do not trust anyone who can promise that without looking at your tax form. If you are seeking advisors to help you, check out their ratings and credentials well before your taxes are due. Do not fall prey to these pitfalls. Take care in planning your taxes, and the only surprise you will have at tax time is how much money you have saved on your tax bill.